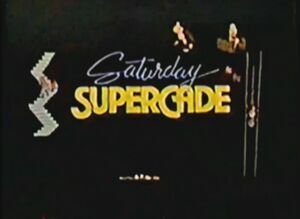 Saturday Supercade is an animated television series based on several arcade games, including Donkey Kong and Donkey Kong Jr. Each episode is approximately one hour long and comprises four shorter, self-contained segments based on one arcade game each. The show originally aired on Saturday mornings on CBS Broadcasting Inc. television network beginning on September 17, 1983. After two seasons, the show's original run ended on September 8, 1984. Ruby-Spears Productions produced the series. While the Donkey Kong segments appeared in both seasons, the Donkey Kong Junior segments ended after the first season. In total there are nineteen Donkey Kong segments and thirteen Donkey Kong Junior segments. Since the show's end, the Donkey Kong and Donkey Kong Junior segments have ceased to air on television. Additionally, the series has yet to be reproduced in any format, and as such only homemade recordings of the DK and DK Jr. segments made during the show's television airing are currently available to the public. Music Corporation of America Inc. was the last known holder of the DK and DK Jr. segments, but the company is now defunct. When questioned by a fan on Facebook, the Warner Archive Collection team stated that the accessible segments of the show may be released on DVD in 2011, with "cool vintage footage" replacing any unavailable segments. Predating Super Mario Bros.: Peach-hime Kyushutsu Dai Sakusen! by nearly three years, Saturday Supercade marked the first animated adaption of any Mario-related series. It marked the first television series featuring either Mario or Donkey Kong, both of whom would later star in their own television series with The Super Mario Bros. Super Show! in 1989 and Donkey Kong Country in 1996 respectively. 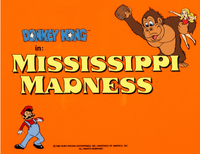 The show also marked the currently only televised appearances of Donkey Kong series characters Pauline, Donkey Kong Jr., and Stanley. Similar to the premise of Donkey Kong Circus, the introduction to the Donkey Kong segments show that Mario apparently owned the circus along with his animal trainer Pauline and the star of the show, Donkey Kong. However, the giant monkey escaped and made his way down a dock on a motorcycle, pursued by Mario and Pauline in their circus van. Exiting the van, the pair gave chase on foot until Mario slipped on a banana peel laid by Donkey Kong as a trap. The tables turned, the pair fled from the approaching ape. However, Mario and Pauline quickly resumed pursuit with a net and followed him up the stairway of a building. Their resultant chase is outlined in the Donkey Kong segments. Most stories had the trio happening on crime, with criminals usually involved in schemes involving theft, fraud, and deceit. Often, the crooks would realize Donkey Kong's slow-wittedness and try to get him to do their dirty work, but in the end, Donkey Kong would either realize the truth himself or Mario and/or Pauline would reveal the facts to the ape, and in the end, the bad guys' plot was foiled. The chase then continued. Outlined in the introduction to the Donkey Kong Junior segments, Donkey Kong Jr. traveled from the jungle to Mario's circus to see his father, Donkey Kong. Realizing that his dad has escaped and without means of finding him, Donkey Kong Jr. is reduced to tears. Bones approached Junior and consoled him. After hearing his story, Bones suggested they follow after Donkey Kong in his motorcycle. Overjoyed, Donkey Kong Jr. joyously yelled his catchphrase, "Monkey muscle!" and took the drivers seat. With Bones in the sidecar covering his eyes, the two sped off on the first of their adventures which are outlined in the Donkey Kong Junior segments. "How Much is That Gorilla in the Window?" We'll get your video friends together. And no one else can do it better. Let's have some Supercade fun! Let's have some Supercade fun, fun, fun! Join all the Supercade fun. Let's have some Supercade fun. Ruby Spears trade show advert from 1984, featuring Donkey Kong. Cast and Crew - Full cast and crew on IMDB. Watch the Donkey Kong segments. Watch the Donkey Kong Junior segments. This page was last edited on February 18, 2019, at 21:40.